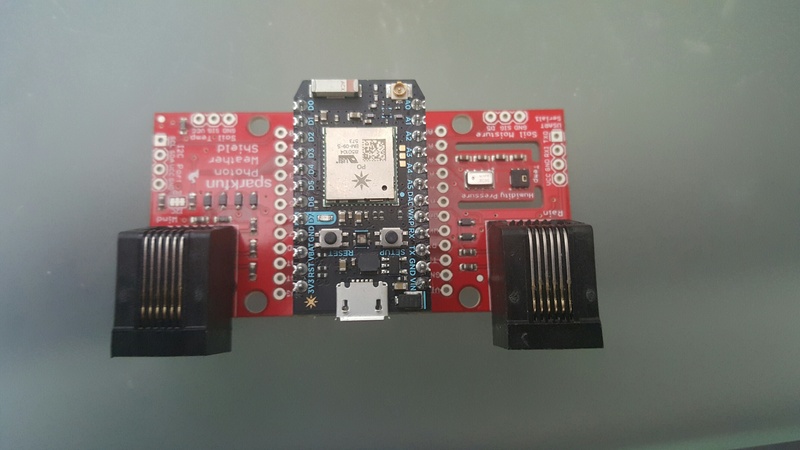 This example demonstrates how to leverage Particle Photon and Microsoft Azure to create a weather station using the Sparkfun weather shield. Particle, creators of the Photon Wi-Fi development kit, and Microsoft, creators of Azure, recently announced a collaboration that starts with a new way to use webhooks to get data from Particle’s cloud to Azure Event Hubs. Event Hubs is a highly scalable publish-subscribe event ingestor that can intake millions of events per second so that you can process and analyze the massive amounts of data produced by your connected devices and applications. Once collected into Event Hubs you can transform and store data using any real-time analytics provider or with batching/storage adapters. By combining the simplicity and robustness of Particle system with Azure Event Hubs, we can use webhooks to rapidly deploy scalable services in the Microsoft Azure Cloud capable of ingesting millions of events per second from remotely programmable Particle devices! In this project, we will specifically look at publishing data from a Photon + SparkFun Photon Weather Shield to an Azure Event Hub which will output to a Web front-end, allowing us to view incoming weather data in real-time! Before you can "claim" your Photon, you need an account with Particle. We will walk through installing the Particle CLI to a Windows based machine. For instruction on installing to other operating systems see the official documentation at Particle. Important: We must install a specific version of node.js (v0.12.4) <= please install from this location. Note: If you are using Windows, be sure to install the .msi. You may need to remove any previous installs of node.js. If you need to manage multiple versions of node.js see: NVM-Windows or NVM-Linux / Mac. To test if it is installed correctly see this link. When prompted, login with your credentials from the previous step. ConnectTheDots.io is an open source project created by Microsoft Open Technologies to help you get tiny devices connected to Microsoft Azure, and to implement great IoT solutions which take advantage of advanced analytic services such as Azure Stream Analytics and Azure Machine Learning. Let's get started by publishing data from the Particle Photon to an existing ConnectTheDots portal. Webhooks are a simple and flexible way for your devices to make requests to almost anything on the Internet. Webhooks listen for events from your devices. When you send a matching event, the hook will send a request to your web application with all the details! We will create a webhook that is ready to listen for events coming from our Photon for forwarding to an existing Azure Event Hub. At a later time, you may wish to remove a webhook. Assembly is straightforward, however, be sure to pay special attention to the orientation of the device when putting everything together! In the Particle CLI type "particle serial identify COM#" (where # is the COM port noted in the previous step) Keep track of this somewhere for the next section on "Claiming your Photon"
Select "Add New Device" and enter the identity received in step 5 of "Configuring the Photon"
1. Head to https://build.particle.io/build/new and create a new App titled "ParticleWeatherShield"
2. Add the SPARKFUN_PHOTON_WEATHERSHIELD library by clicking the "Library" Icon in the lower left (looks like a ribbon), search for "Weather", Select the Library Result, Select "Include in App", Select "ParticleWeatherShield", then Select "Add to this App"
Note: The code begins with some variables for identifying the Particle device once connected to the event hub portal (Org, Disp, and Locn). We then setup the Weather sensor. Next, we enter the loop where we read the Temperature and Humidity, form a json payload, and send to the Webhook we created earlier. 6. Select the "Check Mark" in the upper left to verify that your code compiles without error. 7. Once your code is verified, select the "Flash Icon" to flash the code to your device. You should receive a message indicating success if all went well! It may be useful to monitor events coming into the Webhook Service. After programming the Particle Photon and running, events should begin arriving. These can be viewed in the Particle.io Dashboard or from the Particle CLI. Verify that your device is live and displaying data to the portal. Now that you have successfully published data to the existing ConnectTheDots portal, you can take it further by creating your own ConnectTheDots portal following the steps below. //These are additional MPL3115A2 functions the MUST be called for the sensor to work. //Call with a rate from 0 to 7. See page 33 for table of ratios. //the time between data samples. // Temperature is measured every time RH is requested. Paul DeCarlo is a prof @ #Bauer college of Business @UniversityOfHouston and Software Engineer @Microsoft focused on IoT, Cloud, and Mobile.